Next week we head to Kyoto, Japan to kick off Amulets for Infrastructure. Over the last couple of weeks we fashioned our first series of paper amulets for the project (described further here). 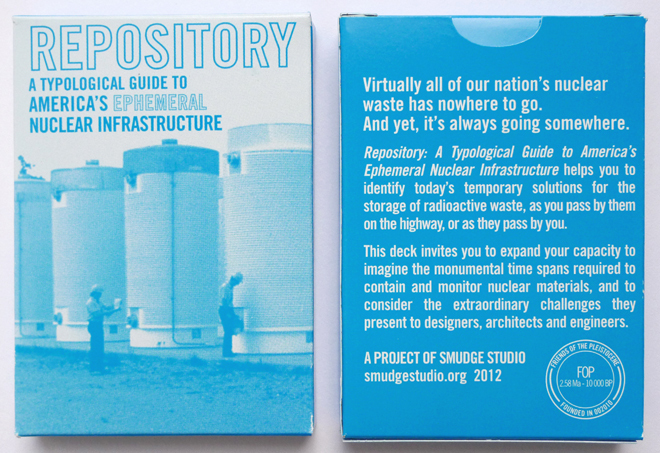 For us, the Amulets for Infrastructure project is less about the idea of “luck” sometimes associated with the concept of amulets or talismans, and more a reminder of ancient knowledges that tell of the power of nonhuman forces to shape and sometimes unseat human plans, including human-built structures and infrastructures. 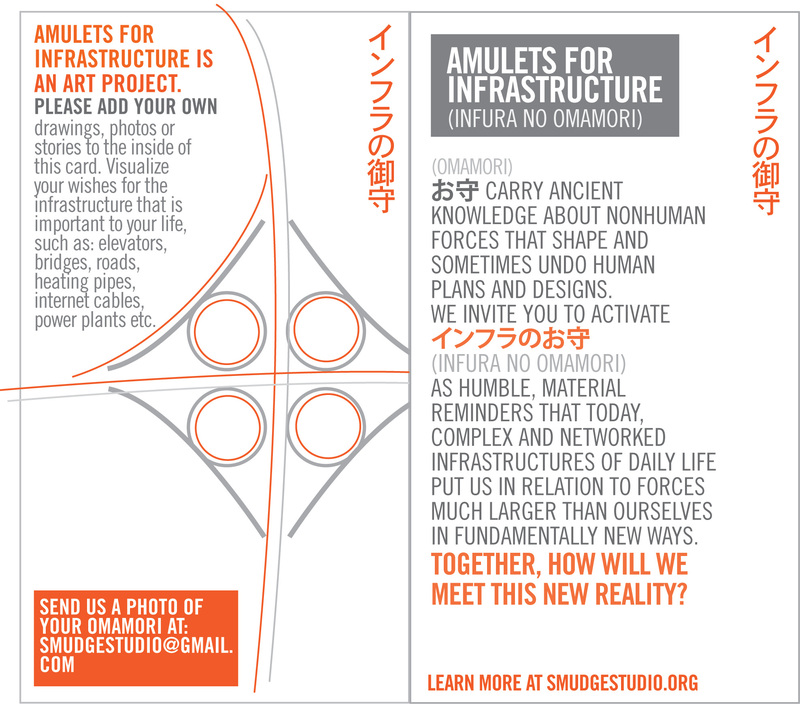 With Amulets for infrastructure, we hope to help extend awareness that future infrastructures and built environments need to be designed and used with geologic earth forces in mind. This awareness is something that a number of people have said was “forgotten” in the design and building of infrastructures directly affected by the earthquake and tsunami in Japan last year. Nuclear power plants located at the edge of the ocean and enormous sea walls designed to deflect tsunamis gave false senses of security, and ultimately failed. 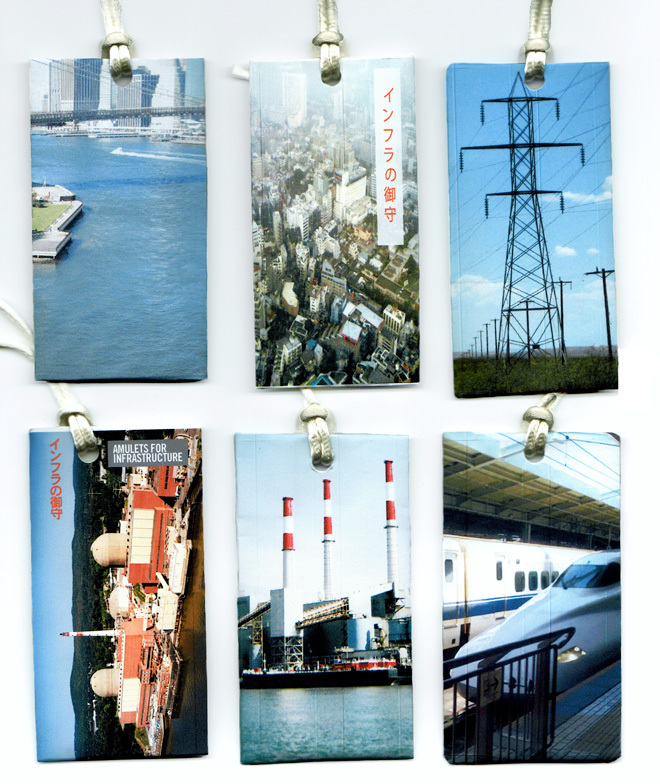 Soon we’ll be distributing our paper amulets and inviting people in Japan (and elsewhere) to adapt and augment them. During the next month, we plan to document our invitations to collaborators in Japan to make their own Amulets for Infrastructure /インフラのお守り(infura no omamori). The project’s page on our website has a 5.5″ x 6.5″ omamori template that you can download and fold, origami style, into your own omamori envelope. You can watch this great DIY video to learn how to fold the origami “bar envelope” that we’ve used for ours. We are also inviting people to send us documentation of the omamori that they make, and stories about their relationship to the infrastructure they are addressing with their omamori. While in Kyoto, we will engage with these realities with people who live in places relatively far from the Tōhoku region. Today, the behavior of an infrastructural grid or node in one place often has ramifications for entire regions, and sometimes the entire globe. Our intentions are that this project will also function practically. We hope it might contribute to efforts now being made to ensure that assumptions about infrastructures such as tsunami walls and power plants—assumptions that added to the suffering in Tōhoku and elsewhere—are questioned and redirected so that such suffering might be avoided or lessened in the future. Between April 9-13th, we’ll be relaying work in progress from the Amulets for Infrastructure project to Sudbury, Canada. There, the Canadian collaborative Dodolab will be facilitating a sister project entitled Amulets for Sudbury project. Together, we hope the two projects will create a transcultural, transglobal exchange between people in Kyoto and people in Sudbury. Stay tuned to the FOP blog and our twitter feed (@geoturn) for project reports. What an interesting project. You come up with the best ideas!